This recipe is a new household favourite and if looking to entertain, this one will be sure to impress your guests. I’m still impressed each time I whip it together, it is just so good! I have decided it will be my new go to dish for when friendships join for dinner- who’s coming over!? 🙂 It is simple in its preparation and explodes with flavour, the perfect dish to kick off the spring season. I have only tried it with salmon, but this herb crust would be absolutely amazing on just about anything. I stumbled across this tasty dish on one of my favourite food blogs, Freshness GF, followed it to point (per filet) and it was perfect. Now for the accompanying salad. This may look a bit familiar (see here) however I adapted it for a more spring-like pop of flavour. Omitting the salty variable and adding cucumber and pomegranates to freshen it up! Again this colourful, flavourful mix is a great addition to just about any protein and leftovers make a great salad topper. 6 Tbsp fresh herbs (cilantro or parsley or both) – I use both! Preheat oven to 400 degrees. Lay salmon in baking dish. Season with salt and pepper. 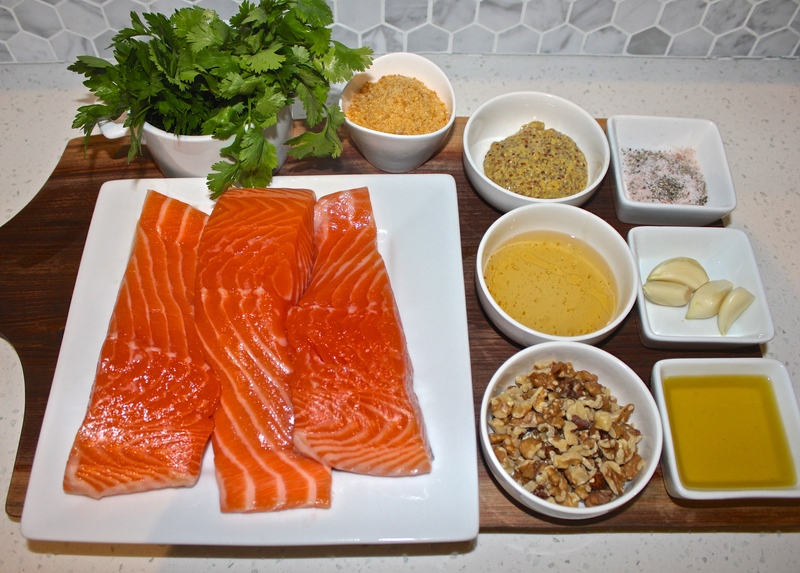 Mix honey and mustard together, spoon over salmon, coating it evenly. Think of it as the glue. In a food processor, combine herbs, bread crumbs, garlic, oil and walnuts. Chop until finely blended. Spoon over salmon evenly including the sides. Bake for 12-15 minutes. When you start to see white oozy parts, it’s done. This recipe is a quick one to whip together, and you really can add as much or as little as you like of each ingredient. The flavours will still pop. 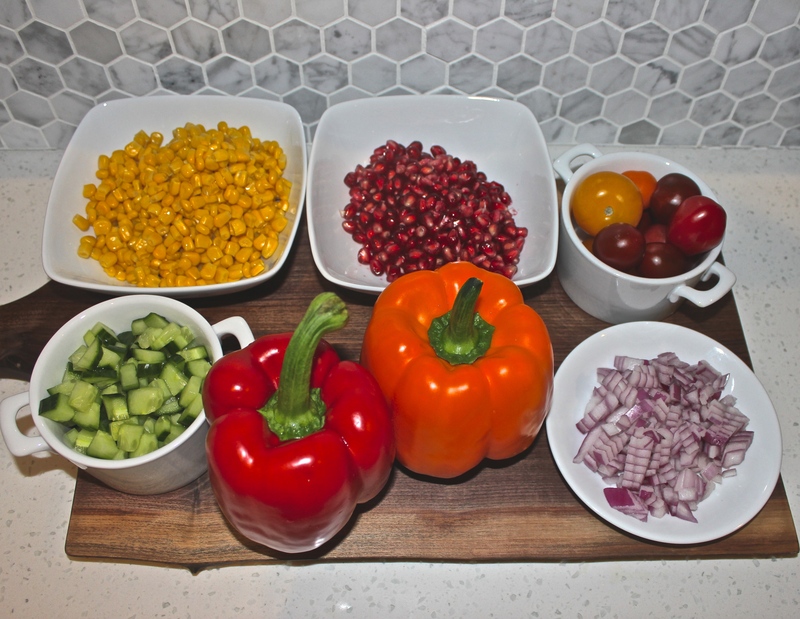 Soften onion and peppers in a frying pan for about 8-12 minutes. Stir in tomatoes, cucumber, and pomegranate. 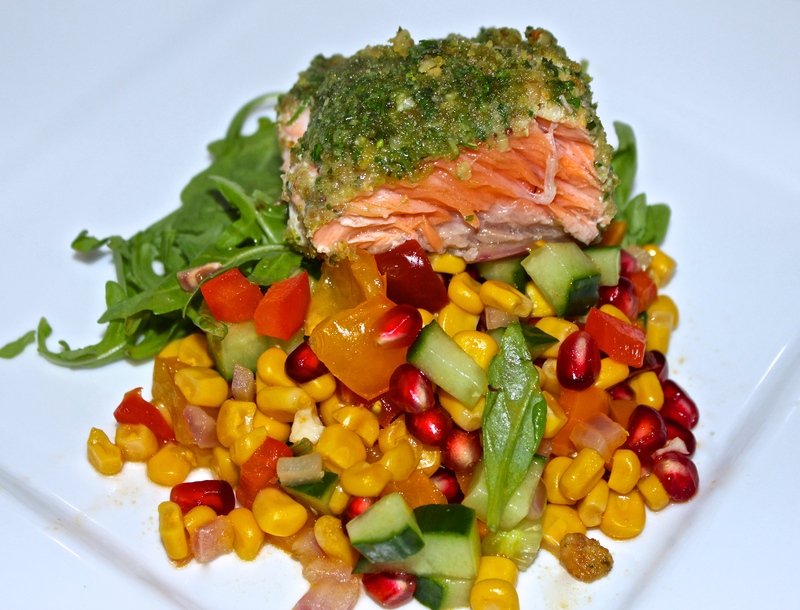 Serve on a bed of arugula with herb crusted salmon, and a squeeze of lime.